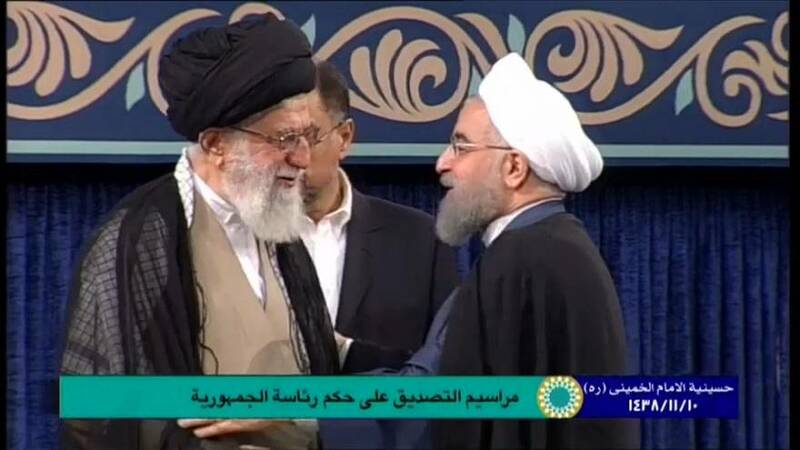 Iran’s supreme leader, Ayotollah Khamenei today gave his backing to Hasan Rouhani as president following the latter’s victory in elections in May. Under the Iranian constitution, the president needs the backing of religious authorities as well as the people. Rouhani will be inaugurated on Saturday. I thank Allah the Exalted for making the great people of Iran proud during yet another notable political and social test and for turning their auspicious presence – in one of the most fundamental national movements – into a lofty step towards protecting the dignity and security of the country and the magnificence of the holy Islamic Republic. The enthusiastic elections, the long line of voters throughout the country the high turnout of participants in electing the president and also the overwhelming votes that the president elect won are all clear signs of the Islamic government’s success in strengthening and establishing the Islamic Republic and the people-based characteristic of this revolutionary government. It is one of the most important and fundamental capabilities of our dear Islamic country – one of its countless capabilities which makes the achievement of lofty revolutionary ideals possible, a harbinger of a bright future for the country and for the nation. With the guidance and blessings of God, in the shade of the Great Imam of the Age’s (may our souls be sacrificed for his sake) attention and benevolence, and by following the people of Iran’s lead, I hereby endorse their votes, appointing the honourable scholar Hujjatul-Islam Dr Hassan Rouhani as the President of the Islamic Republic of Iran. I consider this occasion as a good sign because it coincides with the days leading to the birth anniversary of Hazrat Abi al-Hassan ar-Ridha (thousands of greetings and compliments be upon him). I pray for his success. Furthermore, I strongly recommend that he use this sensitive position as a tool for gaining divine satisfaction and as a provision for the time he meets with God. He should focus his efforts on administering justice, advocating for the underprivileged classes, enforcing the rules of original Islam, strengthening national unity and dignity, attending to the massive capabilities and capacities of the country and being outspoken in highlighting the values and principles of the Islamic Revolution. He should be confident that the valorous and courageous people of Iran will not leave the servants of the county alone in times of difficulty or while confronting the aggression and greed of arrogance. I once more deem it necessary to stress the importance of implementing the economy of resistance, paying special attention to the issue of employment and domestic production. I would like to reiterate that the vote of the people and their “endorsement” depends upon preserving and observing one’s commitment towards the straight path of Islam and the Revolution. Greetings be upon God’s righteous servants.